This brand new edition of the classic book on hepatology provides a concise, clearly presented and well-structured review across the whole spectrum of hepatobiliary diseases by some of the world’s leading hepatologists and hepatobiliary specialists. 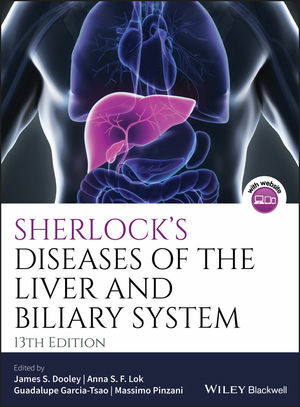 Where many other hepatology textbooks provide detailed accounts of basic science and clinical management, Sherlock's Diseases of the Liver and Biliary System, 13th Edition takes a different approach. Concentrating on the clinical decisions to be taken and the relevant supporting data, it is written and edited to maintain Sheila Sherlock's unique approach, in particular the clarity and layout of the text, and the explanatory figures and tables. The book is thus concise, highly accessible, and generously illustrated with over 700 attractive color figures. There is a pithy approach to each disease based both on evidence and on the authors’ experience, the hallmark of this book. Based on these elements, the 12th edition was awarded first prize in the 2012 British Medical Association Book Awards in the Internal Medicine category. Sherlock's Diseases of the Liver and Biliary System begins by introducing the anatomy and function of the liver to readers, continuing then with in-depth coverage of liver biopsy techniques and interpretation, and fibrogenesis and its assessment. There are then chapters on all aspects of liver and biliary disease including acute liver failure, cirrhosis, portal hypertension, hepatic encephalopathy, ascites, hepatitis B and C, alcohol and the liver, non-alcoholic fatty liver disease, drug related liver reactions, cholestatic, autoimmune and genetic liver diseases, benign and malignant tumours and not least liver transplantation. There are also chapters on the liver in pregnancy, in the neonate, infancy and childhood, in systemic diseases and in infections. This new edition also features four new individual chapters focusing on coagulation, non-invasive assessment of fibrosis and cirrhosis; vascular diseases of the liver and portal vein thrombosis, and nutrition in liver disease. Digital downloads of the figures from this edition are offered on a companion website. Sherlock's Diseases of the Liver and Biliary System, 13th Edition is an ideal primer in hepatology for students and trainees in hepatology and gastroenterology, and a valuable resource for all specialist gastroenterologists and hepatologists, paediatricians, pathologists, radiologists, general physicians and specialist nurses. James S. Dooley, The Royal Free Hospital, London, UK. Anna S. Lok, Michigan Medicine, University of Michigan, Ann Arbor, MI, USA. Guadalupe Garcia-Tsao, Yale University School of Medicine, VA-CT Healthcare System, CT, USA. Massimo Pinzani, UCL Institute for Liver and Digestive Health, London, UK.